It is now time to advertise in our 2019 Show Book! Our Show Book reaches over 700 families and businesses, and is used from May through November. Please click on the files attached to download and print a copy of the template you will need to submit for the 2019 season. ALL ADS MUST BE SUBMITTED BY FEBRUARY 22, 2019!!! Please contact Heidi Zuck for additional information: (814) 450-7380 or via e-mail hzuck57@hotmail.com. Erie Hunt and Saddle Club limited edition zip-front hoodies! Burgundy and heather gray available, assorted adult sizes, $35.00. For more info or to order, contact Heidi Zuck at 814-450-7380. 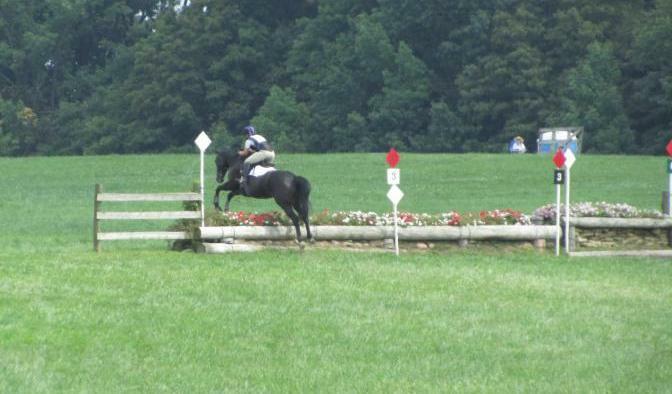 The Hunter Paces are underway, the Mini Trials were a huge success, and the August Recognized Horse Trials have been successful for 48 years but are now finished. This year has also seen a huge boost to membership benefits, as all members and their horses are eligible to Year-End awards at no additional cost. Consider joining the Governing Board and make your ideas come to reality, several board positions are open. On Sunday, September 17 & 24, the EHSC hunter paces are a fun way to wind down the competitive season before the snow flakes start flying. A tailgate party is planned for September 17th, we will provide drinks and hot dogs, and ask you to bring a dish to pass. The picnic will begin after the last rider goes out on course. The costume contest is a favorite of everyone. Come see lions, tigers and bears as well as princesses and pirates. September 24th is the date to save! As always, make sure you have kept your membership up to date and register for the year end awards before you ride! 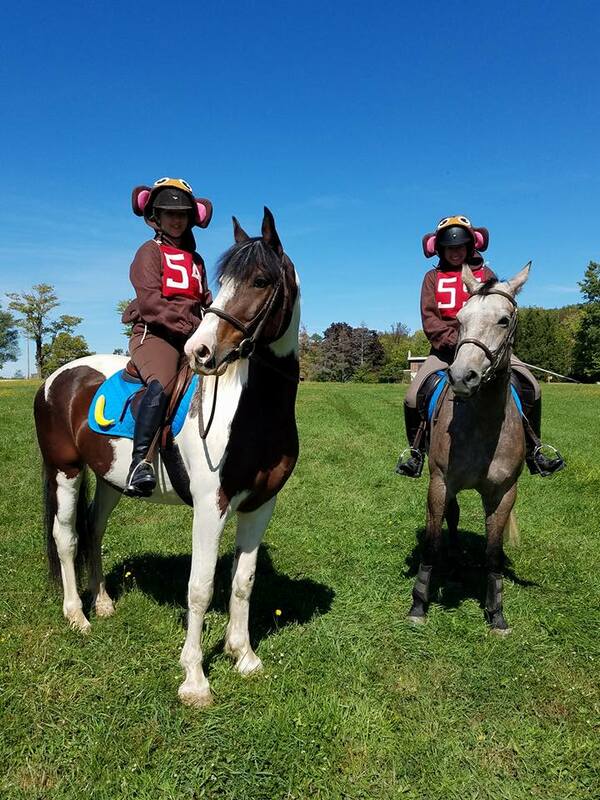 2018 is promising to be a banner year for the Erie Hunt and Saddle Club. We need you to consider a position on the board, to help get your voice heard and get the club to reach it's potential. Board meetings are held once a month, on the first Tuesday of each month. If you are interested or have questions, please contact Ruth Orton at rorton@velocity.net or (814) 460-5265. The EHSC board has decided to sell equipment that has not been used in a number of years. The board is offering EHSC members first choice on purchasing this equipment. If not sold to membership, the equipment will be advertised for sale &/or auctioned. Please contact Karen Copus 814-449-6469 or Peg Hull 814-397-8381 if you are interested. All offers will be considered, please feel to contact us with questions. SUNSHINE CLUB . . .
extends heartfelt condolences to Jean & Mike Spires on the loss of their special Friesian, Echo. On Saturday, October 7th at 10 am come out to EHSC grounds to see a cool demonstration by Jeff Klsak about Falcons and Falconing. This promises to be very interesting. He will be bringing 2 birds not native to Pennsylvania. The Route 98 detour due to construction is over. As you may know, the Erie Hunt and Saddle Club Horse Trials have been cancelled. It is very sad as they have been running for 40 years. 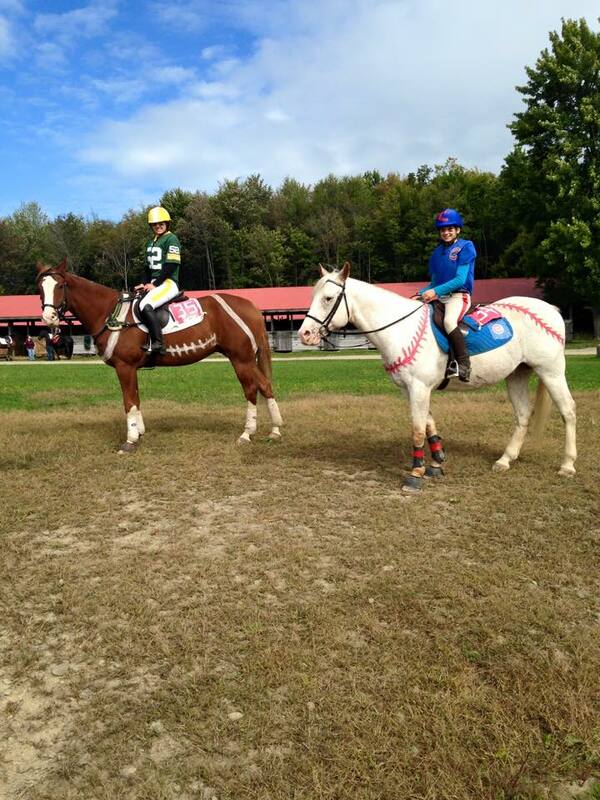 However, we are running the Erie Hunt and Saddle Club Mini Trial on August 27th. As you also know, we are run entirely by volunteers and we need your help. We will be setting up the stadium jumping ring and the dressage rings on Tuesday evening starting at 6pm. We can really use your help. Thank you to all our volunteers! As a non-profit club, we count on the help of our members to run our shows. Without you, we would not be able to run any of these activities that we all enjoy so much. Also as a non-profit, if you have children in need of service hours for school, we are happy to help! 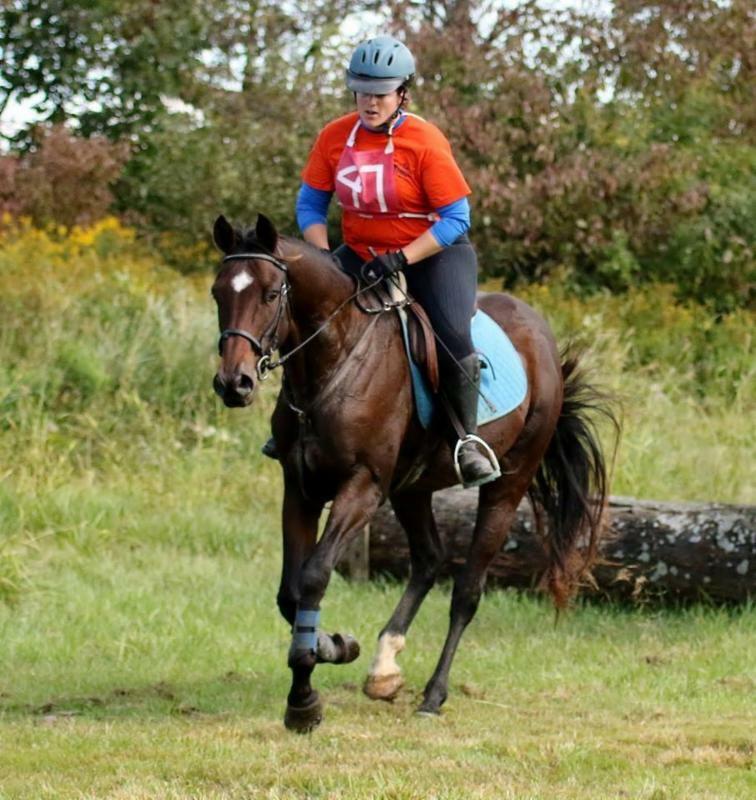 Thank you everyone for donating, sharing posts, and generally spreading the word about Erie Hunt and Saddle Club's participation in the annual Erie Gives fundraiser. 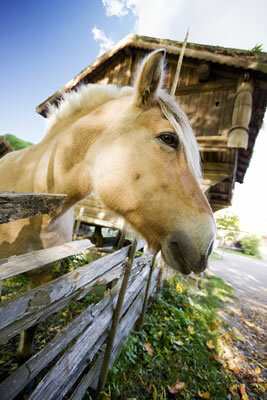 Yesterday, you helped us raise more than $3,000 for our nonprofit, all-volunteer horse-loving group. "Horsemanship through Knowledge" since 1962. Thanks for keeping it going! And thank you to the Erie Community Foundation and Nonprofit Partnership for the hard work and good they do throughout the region! Please Click Here for a letter with additional information. Route 98 will be closed between W. Stancliff Rd and Old State Rd. Going to EHSC from the South on Route 98, turn left at W, Stancliff road. Make a right at the first intersection, Eureka Rd. EHSC will be ahead on the left. I am looking for help, as usual. This year I can offer $50 EHSC bucks to you if you are able to steward the dressage, stadium, or cross country phase of the mini event. Of course I can explain to you how easy it will be. The courses and rings will already be set up from our recognized event which is two weeks earlier. The cross country steward will have a long list of ready jump judges who enjoy jump judging, and can arrange volunteers, and supervise on the schooling day and event day. The dressage and stadium stewards will need to gather a small crew to assist (we have lists and numbers to help) and help put the equipment away at the end of the event. If you are interested in this opportunity to help out and make $50 towards your horse habit at the same time, please call, email or text me. If you are just interested in jump judging, dressage scribing, Bit checking, stadium crew or kitchen help you can also earn EHSC tuits also to be used the same as EHSC bucks. We are behind in our groundskeeping for a variety of reasons - weather and cancellation of the LHPC Horse Trials. Prep work for the Hunter Shows will help us get ready for the EHSC Horse Trials in August. Bring mowers, weed eaters and any of their necessary tools. Look for the "To-DO" list on the scoreboard. If you can't make it, please call Lew to see what can be done on another day. Hope to have a great turnout! The weekend of May 20-21 will be busy with activity at the Erie Hunt and Saddle Club. Open Horse Show I, on Saturday, will be judged by Diane Vogel and chaired by Bobby Ann Christensen and Courtney Potts. If you have questions, you can call them at 573-5888 or email baskmidnightshadow@yahoo.com. If you would like to reserve stalls, please call our stabling chairperson, Michele Plazony at (630) 212-7234. Schooling Hunter Show I is on Sunday May 21 and will be judged by Becki Bloom. Lake Effect Equestrian Team will chair the show. If you can help in the Secretary stand for a little bit or have questions for the schooling hunter show please call 397-8660. The Erie Hunt and Saddle Club 2017 Show and Event Schedule is available on our website, www. 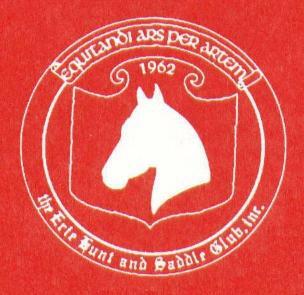 eriehuntandsaddleclub.org, along with entry forms and membership application and year end awards registration forms. The EHSC Board of Directors voted this winter to further extend the benefits of EHSC membership.. All members are eligible for year-end awards for free as a perk of membership. Please note, that you MUST register for the year end awards by filling out the proper form prior to showing. However, if you own more than one horse, you can register them all. Karen Copus is in charge of year end registration and keeping track of the points throughout the show season. If you have any questions, please email Karen at karen@eriehuntandsaddleclub.org or call her at 774-3660 or 449-6469. Your points will not be counted until your registration is complete. The name of the registered horse or pony must remain the same for the entire show season, as this is the only way to accurately track each horse/pony and rider combination. Failure to use the same name for the entire season will result in a loss of points. This is one of the many benefits to an EHSC membership. Other benefits are reduced stabling prices and advance signups for clinics and shows. Also, EHSC members may use the club grounds whenever they like, we just ask that they first call a board member to make sure the grounds are open. 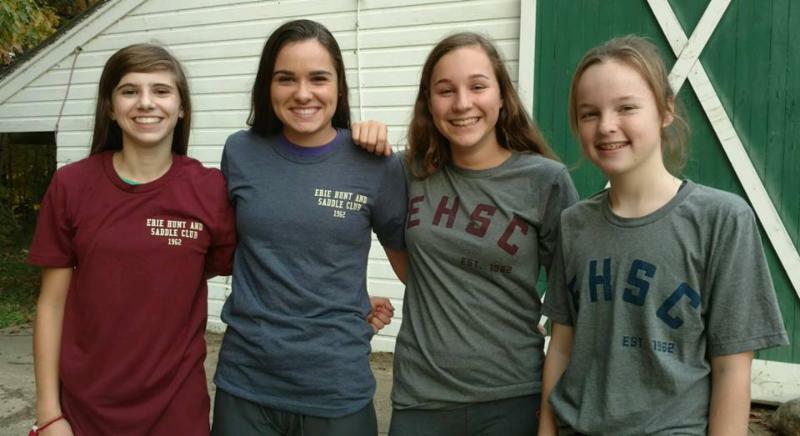 Erie Hunt and Saddle Club tee shirts will be available for purchase at most horse shows this season for $15. They may also be purchased by contacting Heidi Zuck at hzuck57@hotmail.com or calling 450-7380. Got your attention? Banners do that. The Erie Hunt & Saddle Club is offering a limited number of advertising banner opportunities to be displayed at Saddle Club events this season. Club member pricing is $60 for the 2-by-3’ banner, $40 for the 2-by-2' banner. Nonmember pricing is $120 for the 2-by-3' banner, $80 for the 2-by-2’. Contact Jen Rautine 617-750-9083 or JRaut2@yahoo.com for more information, or to secure your limited-edition banner. Checks can be made out to EHSC and sent to: Jen Rautine, 2040 West Welch Road, Waterford, PA 16441. Display your business or send wishes to your favorite competitor(s). LOOKING FOR PERSON TO CLEAN STALLS AFTER SHOWS AT EHSC. NEED TO BE OVER 18 AND ABLE TO DRIVE A TRACTOR. CONTACT PEG HULL AT 734-3764 OR 397-8381 THIS IS A PAID POSITION. PLEASE NOTE: THE MAY PROGRAM --"A QUESTION AND ANSWER SESSION WITH LOCAL VETS" HAS BEEN CANCELLED. 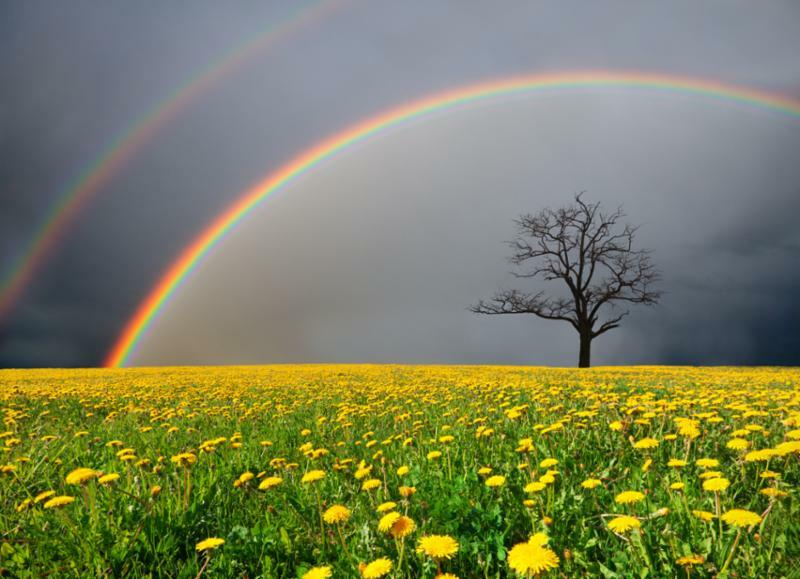 SPREAD A LITTLE SUNSHINE TO YOUR FRIENDS . . .
Our thoughts and prayers go out to Michelle Battko as she recovers from a motorcycle accident. A Go Fund Me page has been set up to help with medical expenses. Condolences to David Hardy's family, David is Nell Hardy's brother. Condolences also to Ed Morrison on the passing of his wife, Pat. Our thoughts and prayers go out to Joyce Berry in her fight with cancer. Also condolences to Kelly Tighe on the loss of her good buddy, Tony. 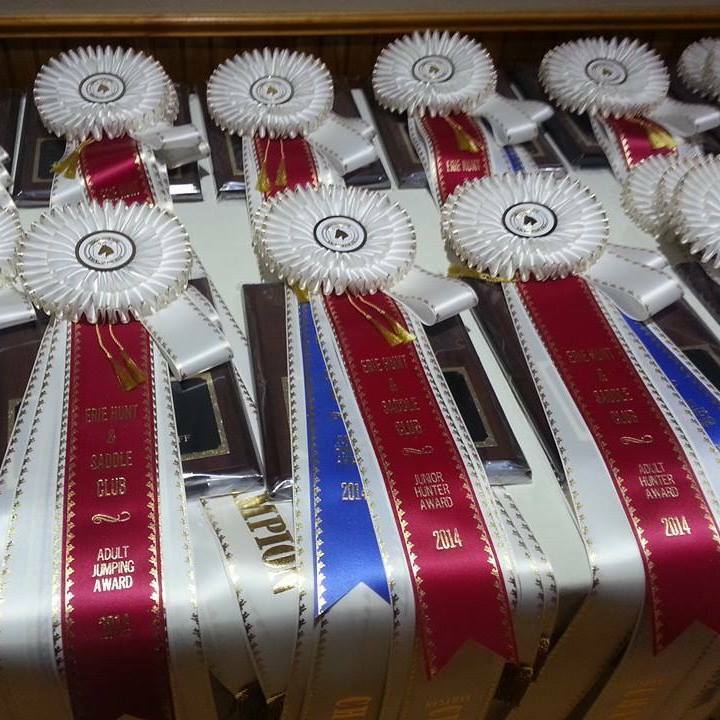 We are offering free registration for Year End Awards to ALL Erie Hunt & Saddle Club members. This is an new benefit of EHSC membership, and one we hope you will take advantage of! All horse/pony and rider combinations must be registered before points can be accumulated. The following steps will assist you with this process. Membership forms and Year End Awards registration forms are available in the show book, online at www.eriehuntandsaddleclub.org and at the Secretary stand at each show. Please make sure to read EHSC Year End Awards Rules available in the 2017 show book and online. Your participation in registering for Year End Awards is vital. In an effort to increase eligibility and competition for Year End Awards, we are offering this as a benefit of membership for 2017. In the future, for this benefit to continue to be offered as part of the membership fee, an increase in participation and new membership would help this program to be a success. Please spread the word and encourage old and new members to sign up. Good luck to everyone in the 2017 show season and hope to see you at the Annual Banquet and Awards Dinner on November 4th at the American Legion Hall in Girard. There will be a rabies clinic for dogs and cats Saturday, May 6 from noon to 2pm at the Erie Hunt and Saddle Club, 6840 Old State Road, Edinboro PA 16412. The cost is $10 cash per pet, and the event is sponsored by the Cloverleaf Riders 4-H Club and Allison Baird, DVM, of the Albion Animal Center. For more information contact the Albion Animal Center at (814) 756-4441. Update March 10, 2017: The Painted Pony Party coming up Tuesday, April 18 has sold out. But stay tuned, we may consider a third! Thank you for joining members of the Erie Hunt and Saddle Club in another fun event. Back by popular demand, we are having another Painted Ponies Party for 35 people (with preference given to those who had to be cut from February’s program). Tuesday, April 18, beginning at 6:30 p.m. at Cheddar’s, 2085 Interchange Rd, Erie, PA 16509. Call and take the reins to reserve your spot ASAP by contacting Vicki Andrews, owner (814) 882-9125. Paint, canvas, brushes, and instruction are all included for only $25 per painter. Send a photo of your own horse to Colleen via text (330) 350-0193 and she will create a one-of-a-kind, black-and-white, paint-by-numbers-style canvas for you to stomp your unique hoof print on. Photos due by April 3. Call Erie Hunt & Saddle Club board member Vicki Andrews for additional information at 882-9125. The volunteer board of the Saddle Club has been busy planning events for the summer. So check out the schedule below and call Brittany Hartley -- handling the horse show and event scheduling for this year -- at 602-7325 or e-mail her at hartley.brittany88@gmail.com. Check out the dates below, and please consider helping out with your experience and time. The club depends -- and is always grateful for -- our event chair people. Help your horse-related business or service reach more than 2,000 active equestrians in the tri-state region and beyond by advertising in the annual printed Erie Hunt and Saddle Club Show Book. The advertising deadline is March 5. Founded in 1962 under the motto “Horsemanship through Knowledge,” the Erie Hunt & Saddle Club has more than 50 acres of riding grounds on the corner of Eureka and Old State Roads in Franklin Center, just outside Erie, PA.
We hold close to 30 horse shows and events from May through October, including two United States’ Equestrian Association-recognized horse trails. Directly reach your target audience by advertising in our 70-page Show Book: A full-page ad is $100, half-page $50, quarter-page $25. 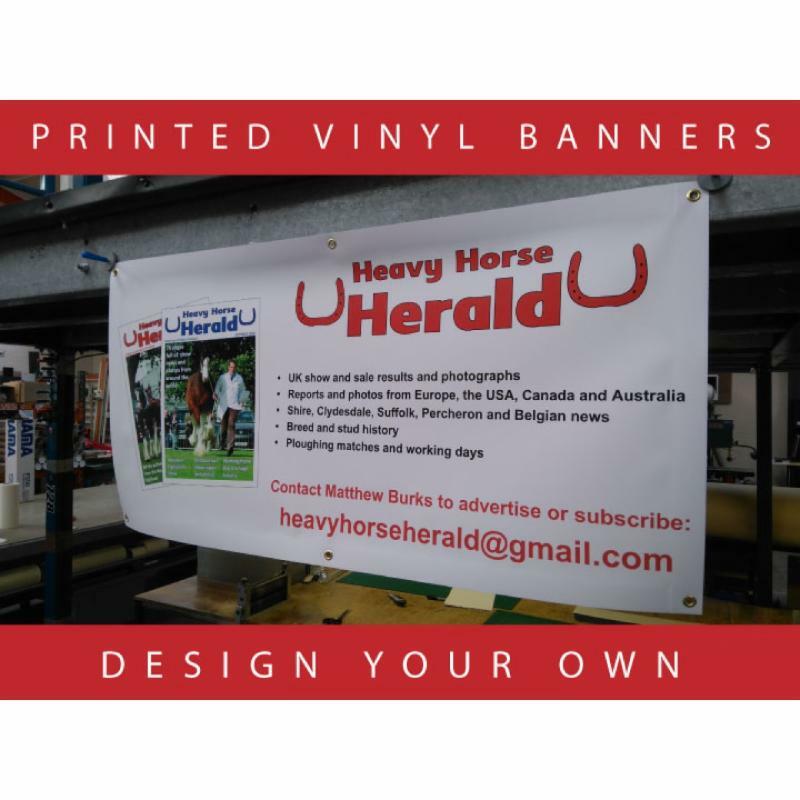 A new advertising option this year will be custom banners to be displayed on the club grounds during specific shows and events – or for the entire season. Size options are 2-by-2 foot or 2-by-3 foot. For more information on banners contact board member Jen Rautine at (617) 750-9083. Please call board member Barb Nash at (814) 450-5728 for more information on printed show book advertising, and to place an ad before the space is sold out for 2017.